These adorable shakers would be great for your Thanksgiving or harvest themed table. 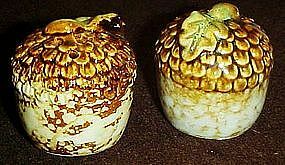 large acorns made of heavy glazed stoneware, Original plastic stoppers, and they have never been used. Measures 2 1/4" tall and are like new condition.